An iconic Grade II listed building on the seafront, a reminder of the importance of the town to the navy in Georgian times, now a museum. It stands on the site of an earlier shutter telegraph, one of a chain of 10 stations between the Admiralty telegraph in Southwark and the naval yard at Deal. The telegraph line which opened in 1796, allowed rapid communication between London and the naval anchorage in the Downs. From 1821 to 1831, the Tower carried a semaphore mast, which was used by the navy’s coast blockade against smugglers. The timeball signal was established in 1855. The timeball, which fell at 1 pm precisely, was triggered by an electric signal so that ships could check their chronometers. It was administered by the Royal Observatory from 1864 until 1927 when it became obsolete and its operation was ceased. 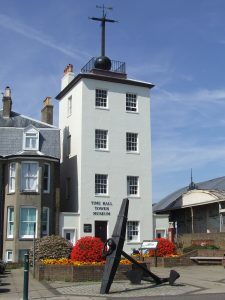 The museum features exhibits about the history of the tower and its use for navigation, signalling and precision electrical timekeeping, and the mechanics of the operating timeball.